CIMSEC is an all-volunteer, 501(c)3 nonprofit that relies on its readers to continue. Consider making a donation here today. The littoral combat ship USS Coronado, upon recent completion of its 14-month Indo-Asia-Pacific stint, marks the conclusion of the U.S. Navy’s third LCS rotational deployment to the region. Thus far, the LCS has not operated without problems, including criticisms about its lack of a potent offensive strike capability. Designed in two separate variants – the monohulled Freedom, and the trimaran-hulled Independence classes – the LCS forms part of broader plans to forward-deploy the bulk of the U.S. Navy to the region. Following the retirement of the Oliver Hazard Perry-class guided missile frigates which used to be the U.S. Navy’s general-purpose workhorse, the LCS represents an alternative platform spanning between a huge, heavily-armed Aegis surface combatant and a small, under-armed Cyclone-class coastal patrol craft which had once engaged the Southeast Asian brownwater navies. The LCS also banks on its modular mission concept, enjoying up to 60-percent of reconfigurable below-decks internal space compared to less than 10-percent on board the Aegis surface combatants. The LCS has come a long way since the first vessel, the USS Freedom (LCS-1), debuted in the type’s maiden rotational deployment. But this ship was unfortunately bogged down by systems breakdown, which was attributed to it being “a research and development platform,” even though the ship remained available for 70 percent of the time – on par with most other forward-deployed vessels. Despite its problems, the LCS even managed to render humanitarian assistance and disaster relief to the Philippines in the aftermath of Super Typhoon Haiyan in November 2013. The U.S. Navy and Lockheed Martin have since made design changes in follow-on Freedom-class ships, such as improved diesel-electric generators, main reduction gear coolers, and other software modifications. Following the Freedom, her sister ship of the same class, USS Fort Worth (LCS-3), became the second LCS to be rotated through Southeast Asia. It was also the first LCS to deploy for 16 months under a “3-2-1” manning concept, that is, having three rotational crews to support two LCS and one ship deployed at any time. This envisages fully-trained crews to be swapped roughly every four months, thus allowing it to deploy six months longer than the Freedom which swapped crews only once every 10 months, thus extending LCS forward presence and reducing crew fatigue. The Fort Worth deployment served as a U.S. Navy test-bed for how the LCS can be employed for sustained periods taking into consideration that the small crew size, rotational crew concept, contractor-reliant maintenance structure, and swappable combat systems modules are all relatively unique compared to the rest of the fleet. Crewing remained a challenge, considering that the Fort Worth was manned by around 100 sailors, compared to 180 on board the Perry-class frigates. 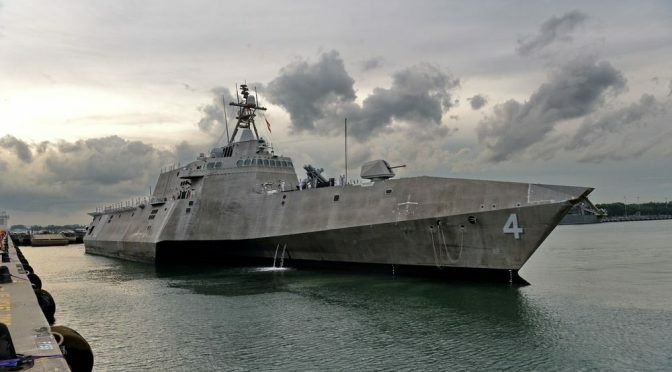 Then in January 2016, a machinery problem sullied the LCS’ otherwise noteworthy performance, resulting in the ship being side-lined for extended periods. After a prolonged period of rectification work, the Fort Worth managed to join the Rim of the Pacific (RIMPAC) exercise in July. Overall, the Fort Worth fared reasonably well – underway for 185 out of 298 days for its entire deployment – totaling over 18 months with the 7th Fleet. It managed to complete numerous bilateral and multilateral engagements, and assisted in the search-and-rescue operations for AirAsia flight QZ8501 in late 2014. The USS Coronado (LCS-4) arrived in the 7th Fleet area of responsibility in early October 2016 – becoming the first Independence variant to deploy to Southeast Asia. Compared to the Freedom variants, the Coronado possesses more fuel capacity thereby providing increased operational capabilities. It is also equipped with the Surface Warfare mission package, comprising two 11-meter rigid-hulled inflatable boats, two teams for visit, board, search and seizure operations, and two 30mm chain guns. Most significantly, this variant boasts a bigger flight deck allowing for expanded aviation operations including two MQ-8B Fire Scout unmanned aerial systems (UAS), and for the first time on board an LCS to Southeast Asia, an MH-60S Seahawk helicopter. In response to criticisms about the LCS’ lack of long-range offensive strike capabilities, the Coronado was outfitted with four RGM-84 Harpoon Block-1C anti-ship cruise missiles. This is roughly equivalent to the four YJ-83 missiles typically fitted on board the Chinese Type 056 Jiangdao corvette. The Harpoon is a venerable but aging design despite numerous upgrades. Until new ASCMs such as the Long Range Anti-Ship Missile (LRASM) arrive, the LCS will have to make do with the Harpoon. This armament, hitherto not seen in the Freedom and Fort Worth deployments, represents a step, albeit an interim one, toward bolstering the LCS’ combat capabilities. The Coronado became a test-bed for surface strike concepts integrating both the newfound missile capability and its organic aviation capacity. The LCS captured the first inverse synthetic aperture radar pictures of surrounding surface contacts with the Fire Scout, marking a critical step toward providing a recognized maritime picture for the LCS, and for over-the-horizon (OTH) Harpoon missile targeting. The first OTH test-fire failed to hit its target in July 2016 during RIMPAC, but following rectification work, in August the following year the Coronado successfully fired a live Harpoon ASCM off Guam in OTH mode using both Fire Scout and MH-60S to provide targeting support. Compared to the previous LCS deployments, the Coronado also attained several new breakthroughs for the LCS Program. Amongst various skillsets including small-boat defense, the Coronado demonstrated a first for the LCS in integrating special operations forces during RIMPAC 2016. Moreover, the ship was able to complete in just seven days extensive “D” Phase maintenance, the most intrusive period of organizational-level maintenance which normally takes as long as 2.5 weeks for the MH-60S helicopter while deployed – another achievement. The Coronado also advanced the 15-4 maintenance concept of shaving the average repair time for maintenance casualties while deployed from 15 to just four days, thus increasing ship availability and readiness, according to Lieutenant Commander Arlo Abrahamson, spokesman for the U.S. Navy’s Task Force 73. Furthermore, in June 2017, the LCS conducted an expeditionary preventive maintenance availability in Cam Ranh International Port, Vietnam – marking the first demonstration of such capabilities for the Independence variant to be conducted outside the normal maintenance hub in Singapore – and a similar feat was accomplished in Lumut, Malaysia. Southeast Asian maritime forces may have invested in larger surface combatants such as frigates, but they continue to operate numerous coastal and patrol combatants which mainly operate well within the shallow 12-nautical mile territorial sea limits. With its shallow draft, the LCS gains more opportunities to engage these often obscure Southeast Asian “brownwater” counterparts, availing the crew to the latter’s diverse range of useful experiences and intimate familiarity with the local littoral operating environment. “The LCS is a comparable sized platform to ships of navies across South and Southeast Asia, which provides an opportunity to conduct a variety of operations and missions with partner nations… and our LCS sailors learn just as much from operating with the partner navies of the region – so the learning goes both ways,” Gabrielson wrote. Such engagements would not have been possible if Southeast Asian brownwater naval elements are unable to venture beyond those littoral confines to train with the U.S. Navy’s large surface combatants. This is also a matter of managing perceptions – a gigantic Aegis destroyer might not make good contrasting optics with the puny Southeast Asian vessels; it could appear too overpowering yet at the same time, excessive for the limited nature and scope of engagements with these much simpler and capability-constrained counterparts. In all, throughout the entire 14-month deployment to Southeast Asia, the Coronado continued and built on the work done by its predecessors. In its 15 port visits across the Indo-Asia-Pacific, the Coronado called on Cam Ranh and Lumut in July and September 2017 respectively – the first for the LCS. In the Sulu Sea, where kidnap-for-ransom attacks by militants were reported, it conducted coordinated counter-piracy operations with the Philippine Navy. The Coronado implemented ship-rider programs by embarking regional naval officers on board the vessel. It also rehearsed the Code on Unplanned Encounters at Sea (CUES) procedures during Naval Engagement Activity Vietnam – another continuation from its predecessors, such as the Fort Worth which practised the mechanism with Chinese warships during its May 2015 South China Sea routine patrol. Notably, however, the Coronado adds to Southeast Asian maritime security capacity-building – leveraging upon its capabilities hitherto not found on board its predecessors to enhance interoperability especially in conventional warfighting. Building on the Cooperation Afloat and Readiness Training (CARAT) exercises in August 2015, when several Southeast Asian navies conducted deck landing practice with their helicopters on board the Fort Worth for the first time, the Coronado’s UAS capability brought new value to the interoperability training – in particular OTH targeting. This capability is especially relevant given the interest lately evinced in Southeast Asia in shipboard UAS capabilities, which constitute a cost-effective force multiplier for budget-conscious regional navies, such as Singapore which retrofitted the ScanEagle UAS on board the modernized Victory-class missile corvettes. In this context, UAS-enabled OTH missile targeting constitutes one of the key focus areas of contemporary Southeast Asian naval warfighting capacity-building. 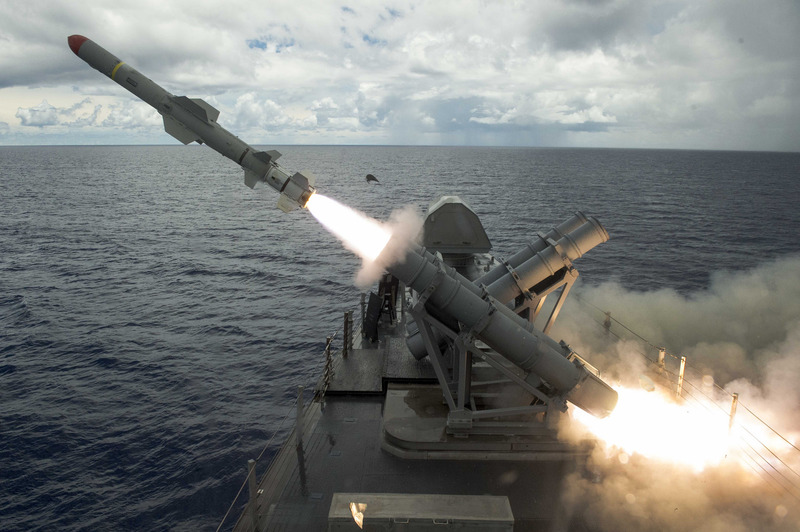 The Republic Singapore Navy refined OTH targeting of Harpoon ASCMs during the inaugural bilateral Exercise Pacific Griffin off Guam in September 2017, and the Coronado participated in the effort. But given the need to balance between fulfilling an ever-growing list of operational demands in the Indo-Asia-Pacific and enhancing operational safety, especially in the wake of the recent ship collisions, capacity constraints may pose potential challenges. Despite extensive automation on board the LCS which meant less sailors required for daily tasks, thereby allowing a rotational crew concept and keeping ships deployed longer than other platforms, a smaller crew also has less time for maintenance. This was addressed by the U.S. Navy’s implementation of a contractor-reliant LCS maintenance structure. During its deployment, the Fort Worth docked in Singapore once every few weeks to be serviced by the maintenance personnel. To boost LCS availability, the Navy also purchased an expeditionary maintenance capability, which consists of two large shipping containers – one acting as a workstation and the other containing spare parts for the LCS, which can be shipped to most ports worldwide. However, the small crew size on board the LCS still poses the issue of getting sufficiently qualified crews to man the LCS, in order to keep up with the high operational tempo that characterizes forward deployments to the Indo-Asia-Pacific. For instance, the delay in getting a new crew qualified to replace them after a change in training standards led to the open-ended deployment of the Coronado’s Crew 204. Crew 203, which was supposed to replace Crew 204, required a ship to get underway to qualify under the new standards. Unfortunately at that time, all available Independence ships were either in overhaul or undergoing repairs – an unintended consequence of a complete reorganization of the LCS Program’s manning system triggered by the earlier spate of LCS engineering woes, such as the breakdowns which afflicted the Freedom and Fort Worth. Considering that demands for security cooperation missions which typically characterize engagements with Southeast Asian maritime forces will probably increase, and given that the LCS is also required for crew qualifications besides rotational deployments, fleet availability would hinge heavily on the U.S. Navy’s overall scheme for small surface combatants (SSCs) that are tailored for such low-end tasks. The current LCS Program envisages a total of 40 ships though the U.S. Navy has maintained a requirement for at least 52 to conduct security cooperation exercises with allies and the low-end missions the ship was originally designed for. A total of 29 LCS had been procured through FY2017 and for FY2018, the Navy would procure the 30th and 31st ships. The December 2015 program restructuring saw the reduction of planned annual procurement rate from about three ships to just one or two. As part of its FY2018 budget submission, the Navy decided to shift from procuring LCS to the FFG(X) separately from the LCS Program, starting in FY2020. But the FFG(X) design may or may not be based on one of the existing two LCS designs. This generates uncertainty overall for the SSC scheme. That said, notwithstanding problems faced by the LCS throughout the three iterations of its rotational deployment, the presence of this type of warship not only fulfilled its intended missions but also opened new vistas for engagement with Indo-Asia-Pacific littoral navies, especially in helping build Southeast Asian maritime security capacity. As pertinently, in such times of troubled peace given the persistent maritime flashpoints and ensuing angst amongst many of the regional governments, the LCS does symbolize Washington’s deepening security commitment to the Indo-Asia-Pacific. Swee Lean Collin Koh is research fellow at the Maritime Security Programme, Institute of Defence and Strategic Studies, a constituent unit of the S. Rajaratnam School of International Studies based in Nanyang Technological University, Singapore. Just in comparison to the LCS, Military Sealift Command’s eight Expeditionary Fast Transports (T-EPFs) were built by Austal in Mobile, Alabama, alongside the Independence-class LCS. Independence was commissioned in 2010 and Spearhead not placed in service until December 2012. Since then, Spearheads have been delivered nearly every six months. With a total of tweleve planned, and while they are built to commercial standards, the Spearheads appear to be a good example of a successful program and perhaps the Navy should consider increasing the order and keep the production line open. There is a bit of difference between what is essentially a high speed ferry and a warship. Further, Spearhead benefited from the lessons learned from several years of operating commercial high speed transports while LCS is a completely new type of ship. LCS could have benefited from the knowledge from other navies that operate similar vessels. The Navy did not listen to Austal, for example, when it came to the bows of the T-EPF, and the damage that resulted had to be fixed, and then modified in subsequent ships. Similarly, the issue between steel and aluminum was mentioned by Austal, but the Navy refused to listen, and then had to go back and fix the earlier T-EPFs and modify the follow ons. There is still much that can be learned from the successes of the Spearhead T-EPFs versus the LCSs.